Number search puzzles start with a grid full of numbers, which will remind you of the way a wordsearch starts with a grid full of letters. You can see an example of the starting position of a number search puzzle to the right. And indeed the principle behind the puzzle is the same: you must use your talents to spot where each of the numbers that are given to you are hidden in the puzzle grid! 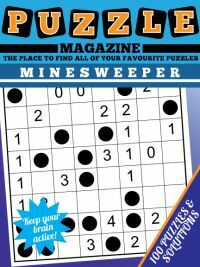 Numbers can be hidden in the number search puzzle magazine grid in a variety of ways. Numbers can be hidden horizontally, which is left to right, vertically, which is top to bottom, or diagionally. Words can be hidden forward or backwards in each of those directions, so there are a total of eight ways in which a number may appear in the grid. 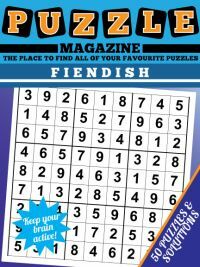 The number search puzzle magazine is ideal for anyone who enjoys word search puzzles but is looking for something a little different. With the fact that they use numbers instead of words they are often a little trickier than wordsearch. That's because there are only ten numbers: zero to nine, as opposed to twenty six letters, so you are generally more likely to find 'false starts' and therefore you may need more attention than with some word search puzzles. 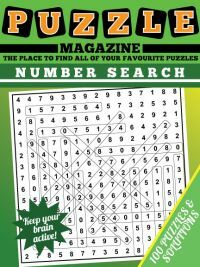 The number search puzzle magazine is ideal for children looking for fun puzzles to do, and of course as wordsearches remain an enduring favourite of grown-ups too then if your childhood is well behind you, number search puzzle magazine is sure to provide enjoyment for you too. 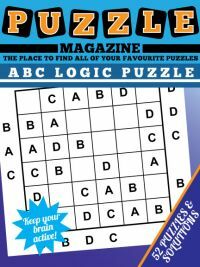 The number search puzzle magazine contains 100 puzzles and their solutions on A4 paper. 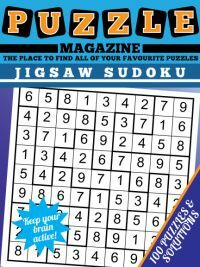 You can now see a sample page from the Number Search Puzzle Magazine. 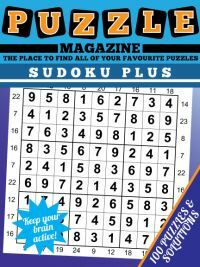 It contains 75 pages: the first 50 contain the puzzles, 2-per-page, whilst the remaining 25 pages have the solution grids 4-per-page with each answer circled for easy checking. Number Search puzzles are great fun, very accessible and also satisfying to solve. But how do you go about solving them? Well, you can solve them however you like. Many people just let their eye wander over the grid to see what they notice, but there are methods you can use too if you prefer to be more systematic. One obvious method is to read across the rows from left to right and see if you notice any of the listed numbers, and then to do the same top to bottom for vertically placed numbers. It is harder for the diagonals to do this, but you can read diagonally each way too if you like. Sometimes you'll find that there are one or two numbers that you just can't find - but believe us, they are there! With these the best technique is to look at the first number in the number you're trying to find - so for 2453 that's 2. Then scan across each row left to right in turn, and find each instance of 2. Then look in each direction from that 2 to see if you can find the 4, and then 5, and then 3. If you can, then you've found the number. If not, move on to the next one. Keep doing this until you find the number. Don't worry if you find these difficult - they are harder to solve than wordsearch. That's because it is harder to remember numbers in your head than words, and also because there are 9 numbers and 26 letters, making it harder to spot numbers in a grid than words.